Why is my data different in Engagio? Engagio allows you to integrate multiple systems to surface engagement and answer compelling questions about Account and Person data across different systems. Though you should trust that Engagio is syncing all of your data correctly, there are a few "gotchas" on why your list/report in Engagio may not exactly match a list/report in your integrated system (ex. CRM, Marketing Automation). This article will detail a few common "gotchas" that will help you understand why the data is not exactly matching in Engagio. 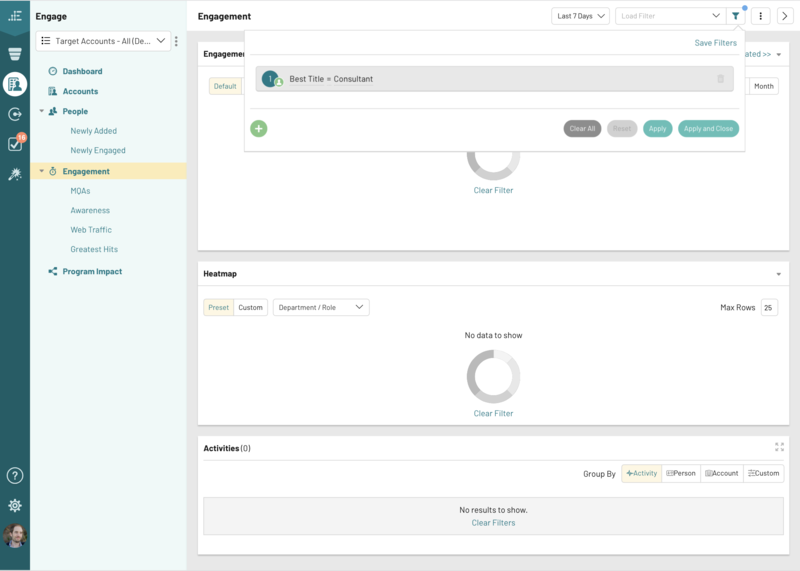 Within the "Engage --> Engagement " section of the Engagio application, Engagio will only show and report on activities with positive engagement. Meaning, if you have configured Engagement Minute Weighting and specified a condition that "zeros out" or gives 0% engagement minutes (ex. Job Title equals 'Consultant' = 0%) those activities and thus people with those activities will not show in this section. I want a list of Consultants in our Target Accounts that have any engagement in the last 7 days. Engagio will sync all people (Leads and Contacts) from CRM and will attempt to match those people (specifically Leads) to an Account. However, there are some reasons that a Lead would not be matched to an Account. This is important to remember when you are using any Account fields. Since an "Unmatched Lead" does not have an associated Account, anytime you use an Account field as a filter, you will always filter out all Unmatched Leads. I want to pull a list of all people in Engagio. I go to "Engage" and use the "All Accounts" list. The list of people will be the sum of Contacts + Matched Leads and will not include all of the Leads that were not matched to an Account. When Engagio pulls activity data from other systems like CRM or Marketing Automation, Engagio will convert the time of those activities to Coordinated Universal Time (UTC). When using the activity date filter this may impact the results you were expecting when trying to answer a question like "how many people visited the pricing page yesterday?" Engagio will return all of the people that visited the pricing page between 00:00 and 23:59 UTC on that day which may differ from a similar report you might be running in your Marketing Automation system (for example) where you have a preference to convert the activity to a relevant time zone to you. Note: We understand that this is far from ideal for most of our customers and it is something we are working on to make this as seamless and intuitive as possible. With Engagio's Batch Reports and Real-time Alerts you can send out lists and notifications that qualify for rules you can specify (ex. send an Alert when an Account becomes MQA). Since the data in Engagio is constantly changing and people are busy, some time may have passed between when you receive a report or alert from Engagio. 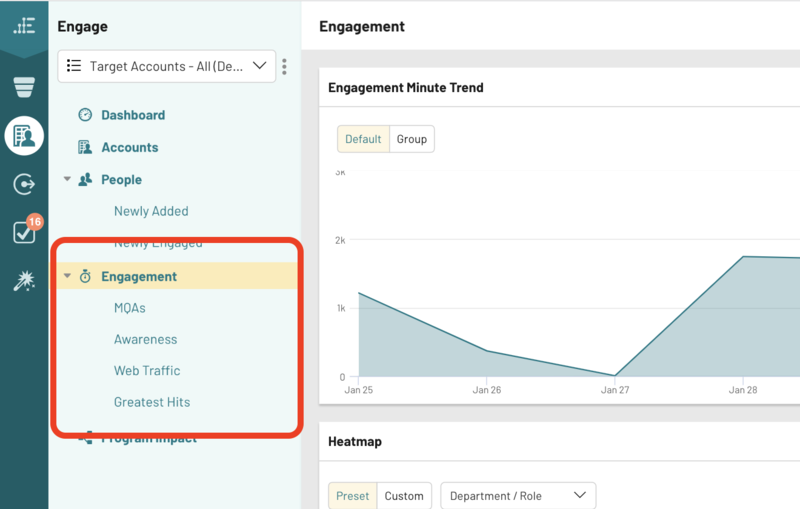 Therefore, when you click-through to view more information in Engagio the data you see in the application is up to date and may be inconsistent with the "once-true" data in your report/alert. I receive my weekly report of Target Accounts that have no engagement in the last 30 days at 8:00 am. The line at Philz Coffee is particularly long this morning and so I don't get into the office until 8:25 am. I open the Engagio report and click to "see the full report" in the application. My email said there were 31 Target Accounts that qualified for the report but when I click through I only see 28. This is because the rules of the report are dynamically applied based on the most recent data when you click-through the email and 3 of the 31 Target Accounts happened to engage that morning so the correct number at 8:25 am is 28 Target Accounts that have not engaged in the last 30 days.